At the Viva Center, we offer affordable, fully furnished and client-ready spaces. We provide a range of room sizes and types, ideal for body work, individual sessions, workshops, meetings, and more. When you choose us as a place of practice, you not only gain use of our space, you also enter a community of passionate professionals committed to helping people live authentic and fulfilling lives. 4 blocks from the Dupont metro, on several bus lines, ample on-street and garage parking nearby. 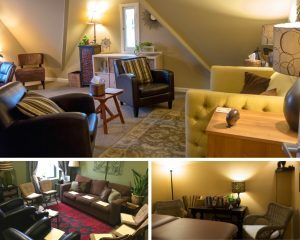 Rooms feature warm lighting, soothing colors and artwork, comfortable seating, white noise machines, yoga mats and massage tables. 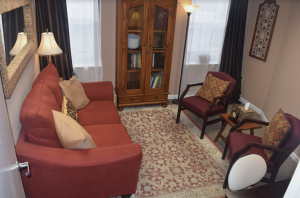 Contact us to schedule a tour and to discuss how we can meet your needs. This room is available at a rate of 35/hr or 235/8 hr day. Luna is one of our larger rooms available for rent, at 15 x 18 ft. 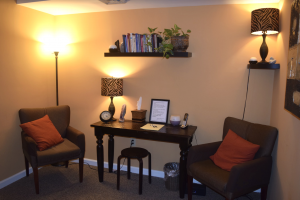 This room is ideal for small groups, individual therapy, or private office use. It is available for 25/hr during standard business hours, or 20/hr Friday-Sunday or before 10 AM any day. This is one of our most affordable rooms, available at 15/hr during standard business hours and 10/hr from Friday-Sunday and any day before 10 AM. This 9 x 5 ft room is ideal for bodywork, individual therapy, or private workspace. Bodywork tables are available to rent for those who need them. This is a standard-sized room at 12 x 11 ft, ideal for therapy, body work, or individual office use. Bodywork tables are available to those who need them. Earth is available for 20/hr during standard business hours and 15/hr from Friday-Sunday and all days before 10 AM. Viva has many more rooms available for rent. Please email us for more information.